A perfect cat, small animal and bird glove. 18 inch Kevlar gauntlet. These gloves offer great penetration resistance with good dexterity. 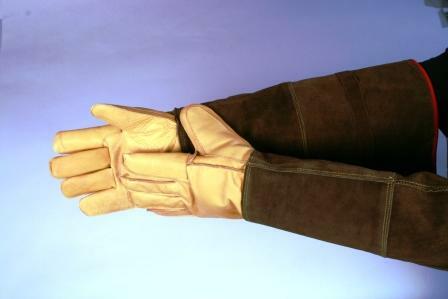 Features a long Kevlar-lined elk hide sleeve & hand. A perfect glove for cats birds, and small mammals. 18'' Gauntlet Gloves cover forearms.